If the past is a foreign country, as L.P. Hartley famously wrote, how does one go about reconnoitering its alien shores, inaccessible landscapes, impenetrable citadels and cities, quaint customs and manners — its essential opacity? Consider, for instance, the ever receding nineteenth century, an age in which men could only marry women, and women men. What a strange world it must have been. And consider these two nineteenth-century characters, a respectable couple, it seems. The bearded gentleman is Adolphe Vidaud du Dognon de Boischadaigne, and the lace-veiled lady is his wife, Charlotte Caignet Hevia. They are my third great-grandparents. Faithful readers of this blog have seen the stern-looking Adolphe before. He matters to my cousins and me because he is, in a sense, the first of our Cuban Gauls. His father was François Vidaud du Dognon de Boischadaigne, who left France for Saint-Domingue during the Reign of Terror with four of his brothers; unlike at least three of them, who returned to France, François No. 7 (as we call him to distinguish him from his homonymous brothers), appears to have spent the rest of his life in the Caribbean, probably in Cuba. In the earlier entry on Adolphe, I could do little more than speculate about the milestones of his life. We really just had the information that M. Vallantin Dulac provided in his “Généalogie de la famille Vidaud du Dognon,” published online: “Adolphe VIDAUD du DOGNON de BOISCHADAIGNE, marié à Santiago de Cuba avec Charlotte COIGNET [sic], dont les sept enfants ont laissé postérité actuelle à Santiago de Cuba.” We know who the seven children are, but then there were more questions than answers. We wanted to know whether Adolphe was born in Cuba or France. We were curious about how he and his younger brother, Adelson, had come to marry two sisters, Charlotte and Corinne — a triumph of alliterative love. We thought Adolphe must have died in Cuba, but we weren’t sure. At one point — for a few minutes — we thought we had a firsthand account of a visit by an American traveler to his coffee plantation, named La Carlota — a sad instance of briefly mistaken identity. We did have a portrait of him, but it wasn’t in the best condition. To apprehend him, I could stare into his severe visage hoping to be carried by the wings of physiognomy, or I could close my eyes and think of, well, perhaps someone like Victor Hugo or Lev Nikolaevich Tolstoy, whom I thought he resembled. But Adolphe, of course, a ghost from the past, escapes me. The nineteenth century won’t come to an end. Its digital life is expansive. As weeks and months passed, readers of this blog, including old and newly found cousins, have kept searching for the elusive Adolphe and Charlotte. A gentleman from Barcelona, you may recall, contacted me with childhood pictures of his own grandmother, Juana Amelia Vidaud Caignet, Adolphe’s and Charlotte’s daughter. He also provided me with a copy of the his father’s birth certificate. Rafael Calbetó y Vidaud, as he was called, was born in Havana, where his father commanded the Presidio, in 1893. 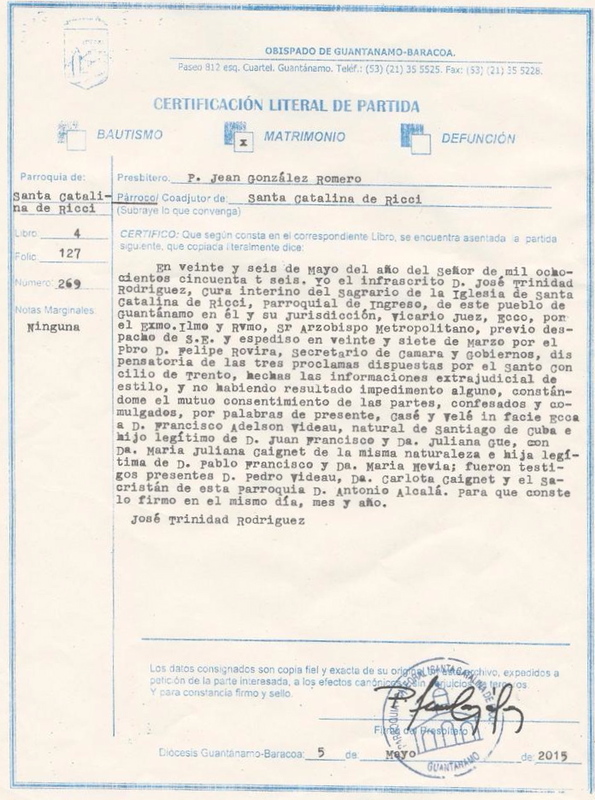 In the document, Amelia’s parents are said to be living (unlike her father- and mother-in-law, who had died in the province of Girona, where her husband was from). Adolphe’s and Charlotte’s birthplaces are mentioned as well, but their names are now given in Spanish, and Adolphe has even acquired a new first name, which we had never heard of before. The child, Rafael, is said to descend “por línea materna de Don Pedro Adolfo Vidaud, natural de Santiago de Cuba, provincia de ídem; y de Doña Carlota Cagnet, digo Caignet y Herrera, natural de New Orleans, casados y vecinos del mencionado Santiago de Cuba.” Whoever copied the original certificate seems not to have been in top form; not only is Caignet at first misspelled, Carlota’s maternal surname is changed from Hevia to Herrera. Yet one thing appears to be certain. 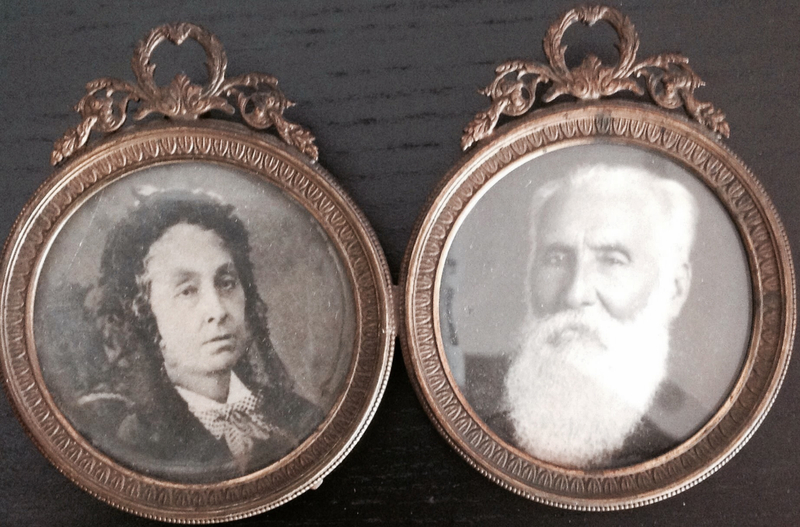 Both Adolphe, or Pedro Adolfo, and Carlota, or Charlotte, were still living in the 1890s. 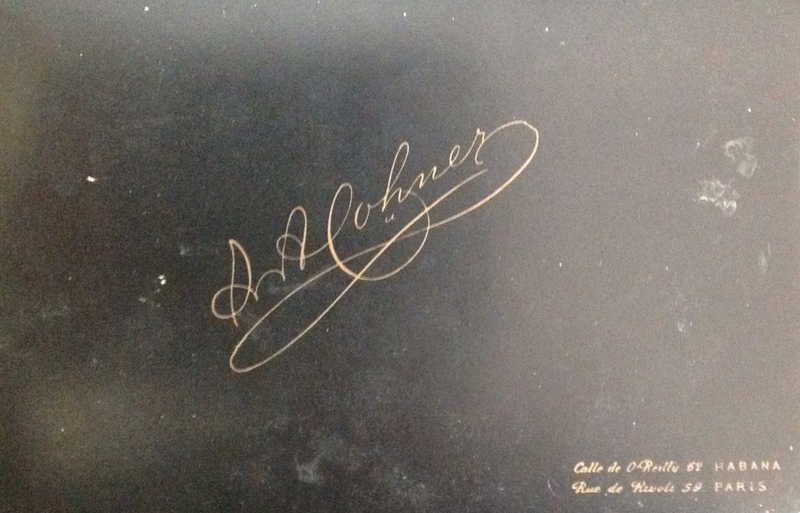 And we now had official confirmation of Adolphe’s Cuban birth. The nineteenth century, living on through the web, can fork into endless paths unless the Blogger — who is dangerously related to Félix B. Caignet, master yarn spinner — can exert a measure of storytelling self-control. Let’s resort then to an old-fashioned narrative, Nunú’s notebook, with its finite number of pages. She was, after all, a grandchild of Adolphe and Charlotte, and has interesting things to say about them. 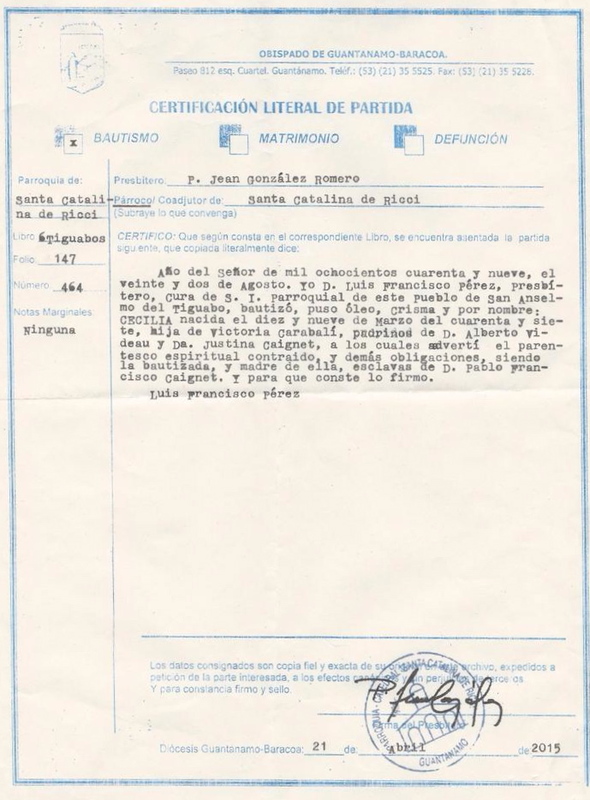 Her description of her grandfather is spot on: “Mi abuelo era un anciano alto con una barba grande, blanca, un aspecto patriarcal.” Sans blague. 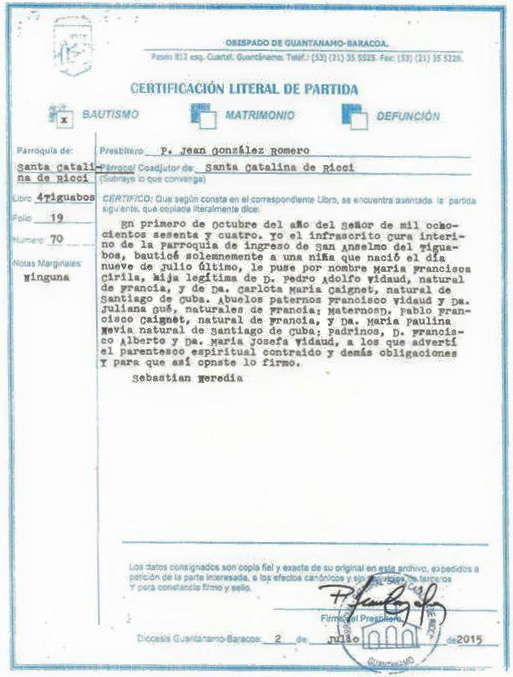 A family tree crafted and placed by someone else at the beginning of Nunú’s notebook claims that Pedro Adolfo was born in 1820 and María Carlota (she too gains a new name!) in 1830. But, alas, Nunú’s nineteenth century does not fit altogether neatly with what other documents say. For one, her memoirs recount that Adolphe was born outside of Cuba: “Mi abuelo Adolfo Vidaud Gué y un hermano, Adelson, vinieron a Cuba y compraron tierra en las montañas y fomentaron sus cafetales. Yo creo que ellos deben haber venido a Cuba por los años del 30 al 35 del siglo pasado.” Does this mean, then, that François No. 7 and his wife, Anne-Julienne-Aimée Gué — who was born in Saint-Domingue and married her first husband in Philadelphia — went to live in France after they were married, supposedly in Santiago de Cuba, and that their two children were born on the other side of the Atlantic? And would it make any sense for a boy younger than fifteen to migrate with his even younger brother to a strange island in the Caribbean? 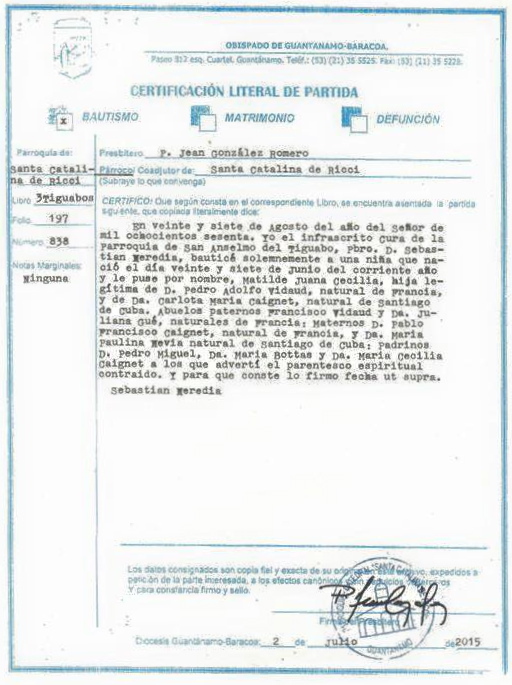 And why, then, would Rafael Calbetó y Vidaud’s birth certificate claim a Cuban birth for “Pedro Adolfo”? What a tangled web we weave even when we do not seek to deceive. Nunú herself is aware of the difficulties of reconnoitering the past, especially when it comes to the Vidauds and the Caignets, inhabitants of several foreign countries. After telling the straightforward story of her father’s migration from Spain to Cuba, she prefaces the tale of her maternal ancestors with a caveat: “Por parte de mi mamá las cosas se complican.” It is indeed complicated. She starts with the French Revolution, but she has more questions than answers: “La revolución francesa fue a fines del siglo antepasado. Yo no sé si antes o después, ni por qué, muchos jóvenes franceses emigraban, venían a Cuba, a Sto. Domingo, a otros países de América, compraban tierras, fomentaban cafetales.” In her account, Adolphe’s father and mother, the elusive François and Anne-Julienne-Aimée, are absent. This is not surprising. Those two remain the most elusive leaves in our family tree. If chronology and motifs are hard to pin down, at least there are some other “facts” pertaining to the Cuban Gauls. Nunú’s tale of the Caignets starts with her second great-grandfather, Francisco, or François, who settled in Santo Domingo — by which I think she means Saint-Domingue or, more accurately, Haiti — where he is the owner of “un cafetal muy grande, muy bueno.” She then writes about a slave revolt in 1841, which forced owners to leave their coffee plantations and “the island” itself. The date is perplexing, as slavery had been abolished on Hispaniola by then, even on the western side of the island, Santo Domingo, occupied by Haiti from 1822 to 1844. (Ah, my readers, I confess I’ve learned History by surfing the web.) Nunú cites “mi tía” as the source of this story, and I assume she means Magdalena Vidaud Caignet, Adolphe’s and Charlotte’s sixth child, a remarkable woman whom she later credits as her only teacher. In any case, much earlier than 1841 (perhaps 1814? 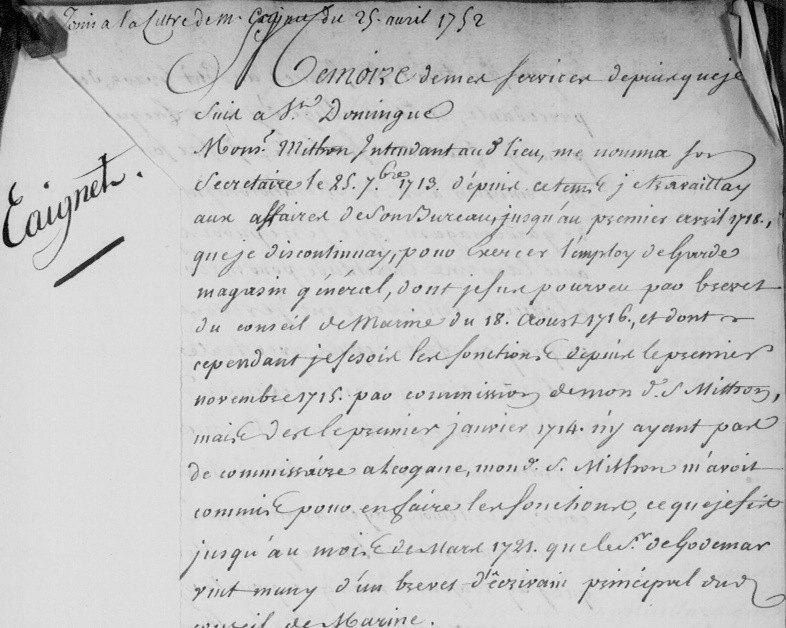 ), François Caignet, a widower, moves to Louisiana with his son, also named François. In New Orleans, the younger François marries “una señorita de padre español de apellido Hevia,” and this young lady’s mother, Nunú goes on, was “una americana.” They had five children: Carlota, Corina, Benjamín, and the twins Luisa y Cecilia. The family tree at the start of Nunú’s notebook identifies the mother of these five children as María Carlota Hevie, or Hevia, who was born and died in New Orleans. But, again, it’s all rather confusing. María Carlota’s husband is referred to as Pablo Francisco Caignet, born in Puerto Príncipe, RD — the capital of Haiti, Port-au-Prince, improbably located in the Dominican Republic. Be that as it may, Nunú proceeds to mention the death of María Carlota Hevia (whom she does’t mention by name) upon the birth of her twins, and François’ subsequent decision to migrate to Cuba with his five children. 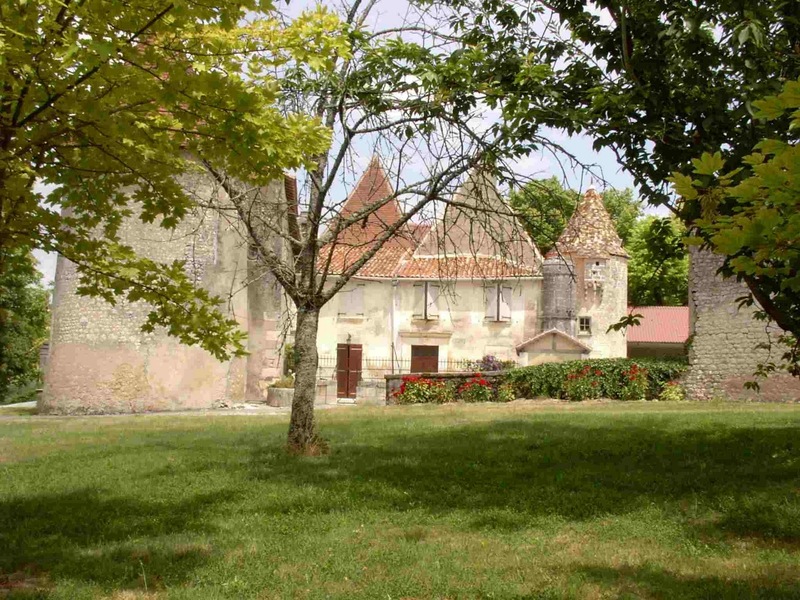 In a fortuitous turn of events, François ends up purchasing land adjacent to the property where the two Vidaud brothers had settled. The rest is a story of friendship and love: “Naturalmente hicieron amistad y poco después se casaron los dos hermanos Vidaud con las dos hermanas Caignet: Adolfo con Carlota, mis abuelos, y Corina con Adelson.” Nunú paints an idyllic picture of life on the numerous coffee plantations owned by these people of French descent in the cool mountains of Oriente: “La vida en los cafetales era agradable. Eran muchos vecinos amigos. Tenían sus fiestas, almuerzos, comidas. Tenían esclavos.” Like other writers before her, Nunú treats slavery not without a measure of ambivalence; even as she decries and describes the horrendous cruelty of some slaveowners, she underscores the benevolent nature of her — our — own ancestors. Not without authorial trepidation, I shall return to this subject in the future. Dear reader, if you’re a little confused amid so many old branches and twigs, so am I. The art of reconnoitering the past takes you into a forest as thick the ancient vegetation of Hispaniola — a landscape now virtually vanished on the Haitian side, but once upon a time, I imagine, full of trees and ferns and orchids and many-colored birds. After all, this is the island Columbus called “la más hermosa cosa del mundo” — though, of course, he famously described several other “discoveries” in equally glowing terms. Speaking about these men who served the various monarchs of Castile and Spain, we’re about to embark on an a voyage of exploration far more Historical than anything we’ve previously seen in this silly little blog. My readers, we’re about to discover an actual reconnoiterer, a man named José Antonio de Evia, or Hevia, whom we believe to be the grandfather of Charlotte Caignet. From 1785 to 1786, Hevia explored and charted the Gulf of Mexico from Florida to Texas. But those things are in the future. Previously, on “The Cuban Gauls”: your three-year-old Blogger is flying over the North Atlantic on a Cubana de Aviación Bristol Britannia. The turboprop-powered airliner has just taken off from Gander, where the new Cuban exiles were served tomato soup. Sitting next to him is his father, Roberto, who had fallen two days earlier as he walked in Havana, badly injuring his chin against the sidewalk. The father is now asleep, and the cheap Soviet bandage is falling off his chin. Next to him is Ana María, his mother, who can’t sleep. She’s thinking of what the doctor back in Havana told her when he found out that the small family was leaving the country and its members were, in effect, counter-revolutionaries: “So you are worms? In that case, we cannot conduct any further tests. Make sure you take your husband to a hospital as soon as you get to Madrid, as he may have a brain tumor.” On this night, flying over the black and cold Atlantic, my mother feels very alone. But that, for now, is another story. Flash forward. Los Angeles, 3 October 2014, 6:58 p.m. I’m on Platform 2 at Union Station, waiting for the Gold Line train that takes me to Jim’s house, where I spend the week-ends watching Scandinavian cooking shows, etc. A day earlier, on Facebook, I announced I was probably discontinuing this blog, as I have a far more important writing project to complete. But then there’s a beep on my cellphone. It’s an email from a gentleman near Miami surnamed Vidaud. With lovely politesse, he tells me that his grandfather was one Louis Vidaud, born circa 1882, and that he has two octogenarian aunts, one who thinks she was born in La Reunión. In his family, he tells me, “there has also been this story about the tragic loss of the plantation and Louis Vidaud‘s ties to it.” I’m now on the train, going through Chinatown, my head spinning as I reread the email with its ghostly invocation of the farm in the Sierra Maestra and those who dwelled there. Later that evening, I receive a second email, this one from a twenty-five-year-old man in Miami, who descends from Sévère, or Severo, Vidaud Caignet, my grandmother’s grandfather’s brother. This young man’s knowledge of the Vidauds in Cuba is far vaster than mine — I have now learned much from him — but he has seen that I’m posting old family photographs, and he wonders whether I might have one of Severo. He also tells me he has “an old and terrible photocopy” of Adolphe Vidaud du Dognon de Boischadaigne, the father of both Severo and Alberto Vidaud Caignet, my grandmother’s grandfather. As it turns out, Mari has a copy of that image too. 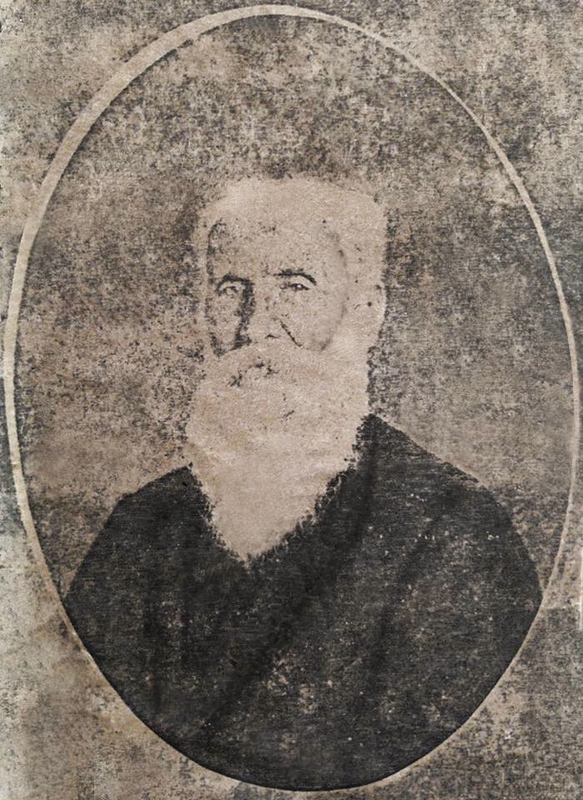 Here he is, Adolphe Vidaud du Dognon de Boischadaigne, a copy of a copy of a copy, the white-bearded and stern-looking residue of a Victorian paterfamilias. He had a brother named Adelson. The two brothers married two sisters surnamed Caignet (M. Vallantin Dulac misspells it as Coignet). Adelson and Corinne had four daughters, but I don’t know anything about them at this point. 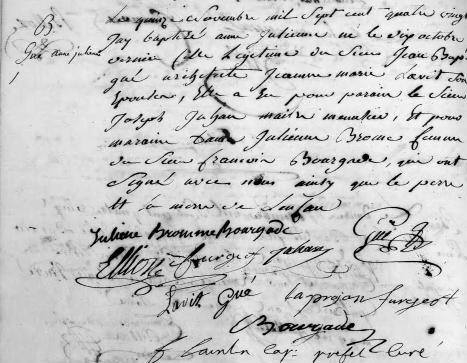 According to M. Vallantin Dulac’s genealogy, Adolphe had seven children who “ont laissé postérité actuelle à Santiago de Cuba.” His chronicle, as far as it concerns our branch of the family, ends there, but we know the names of those seven brothers and children, and the names of many of their many children, and of their children’s children, etc. We are, indeed, members of that posterity. But we don’t know much about Adolphe himself. Vallantin Dulac states he was married in Santiago de Cuba, but says nothing about his birthplace or that of Adelson. Were they born in France or in Cuba? How did they end up marrying two sisters? What did they do in Santiago? When did they die? What follows is a bit of a leaf storm in the family tree, a veritable forest of French names, three or four twigs called François. We do know from Vallantin Dulac that Adelson and Adolphe’s father migrated to Saint-Domingue in the wake of the French Revolution. François Vidaud du Dognon de Boischadaigne (thank heaven for copy and paste) was born in 1764 at the Château de la Dourville, near the village of Aubeville, which in turn is located 22 kilometers southwest of Angoulême, in the Poitou-Charentes region. Our François was the grandson of Jean Martial Vidaud and Anne de la Farge, and son of Jean André Vidaud, comte du Dugnon, and Luce Jayet. He was one of fourteen siblings, twelve of whom were born in the same ancestral château. At the time of the Revolution, according to the Wikipedia entry on Aubeville, “le fief de la Dourville était la propriété de messire Vignaud du Dognon.” At the time of the Revolution, too, such terms as “fiefdom” and “my lord” would have begun to sound terribly antique. At the time of the Revolution, during la Terreur, one of François’ younger siblings, a priest also named François, fled the country and sought refuge in the colony of Saint-Domingue. That’s how the Vidauds first came to traverse the cold and gray Atlantic. It was the first of many such crossings. The good priest François Vidaud du Dognon would end up fleeing Saint-Domingue for Philadelphia. Even though he did much to fight the abusive treatment of slaves, M. Vallantin Dulac tells us, he still had to leave the island “échappant à une mort certaine infligée par la révolte des esclaves en ce pays.” Ah, those rebellious slaves — more on them later. After the Empire was proclaimed in 1804, the Abbé François, with two of his brothers, returned to France, becoming a cathedral canon in Angoulême, where he died in 1845. Could our François be one of the two brothers who returned to France with the priest? One of them — again, Vallantin-Dulac recounts — was Jean Michel Vidaud, chevalier du Dognon, seigneur de Pommeret, later comte du Dognon. He was divorced from his wife on 1 messidor II, after leaving for Saint-Domingue, but remarried her on 14 prairial XII, upon his return to France, and I mention this because I adore the revolutionary calendar. The second brother who accompanied the priest back to France was named François, like the father of Adelson and Adolphe. M. Vallantin Dulac doesn’t say so, but I’m inclined to think that it must have been one of the two other brothers named François, perhaps the eldest, born in 1758, but more likely the one born in 1765… Because we have our François down as marrying one Anne-Julienne-Aimée Gué in Cap-Français (maybe), which is present-day Cap-Haïtien, sometime in the mid-1790s (maybe), because in the late 1790s (maybe), that same lady (whom sources seem to call just Julienne), marries one Julien Tardy in New Orleans (maybe). If the genealogies are correct, Julienne Tardy (née Gué) and her husband Julien are (back?) in Santiago de Cuba, where their daughter, Anne-Joséphine Tardy, is born at the turn of the nineteenth century. Her half-brothers are Adelson and Adolphe Vidaud du Dognon de Boischadaigne. But could these boys have been born in France after Anne Joséphine’s birth in Cuba, in which case François would have been Julienne Gué’s second, not first, husband? More on that, too, later. Our sources are vague and at times contradictory, mistaken and perhaps even apocryphal. In my imagination, at least, François Vidaud du Dognon de Boischadaigne marries Anne-Julienne-Aimée Gué, sixteen years his junior, in Cap-Français, where she had been born. They flee for Santiago de Cuba, where he dies, and then she ends up in New Orleans, where she, a very young widow, marries Julien Tardy. Or perhaps François and Julienne flee for New Orleans, where he dies and she remarries, leaving then for Cuba with her new husband and her two Vidaud boys, Adelson and Adolphe. Both versions of this story of marriage, childbirth, widowhood and navigation are vertiginously extreme. But the Gués seem to have been a family to whom remarkable things happened.